M.G. 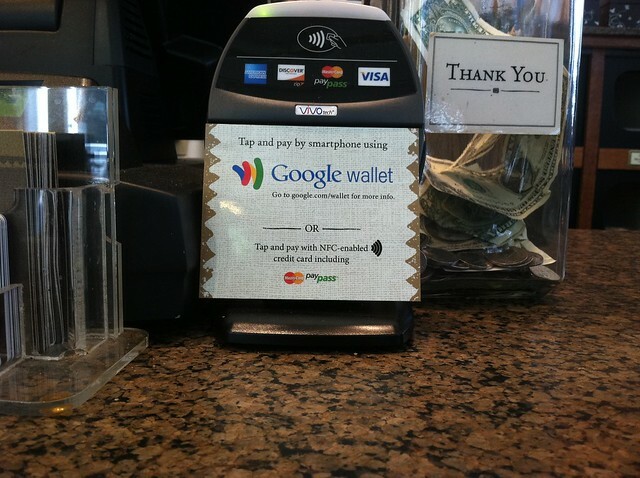 Siegler reports that Google (s GOOG) might be launching its somewhat delayed Google Wallet service sometime today. From the looks of it, it might actually be out in the wild. Our own Ian Kennedy snapped this photo at a Peet’s Coffee shop near our offices in downtown San Francisco. Google has updated the Google Wallet website as well. More details to follow. VISA has been trailing this also with an App on the iPhone. Saw a program about 2 months ago here in Australia that the CEO of VISA using it in USA. VISA are looking at fazing out the credit card all together and use the tap n go method through your smart-phone. He believes that this version is more safer than the current credit cards with the chip in it. It’s officially released now and is being pushed out to for Sprint Nexus S owners today as a free update. I will be impress when they let users pay online with cash card. saw this at a peets in Los Gatos this weekend as well. looks like Google <3s Peets. My hope is that next year, all smartphones have NFC in them. Hopefully the iPhone 5 will so it will kickstart the process. Wasn’t Google trialling Wallet in SF already, with Peet’s as one of the partners? Is this a new addition for the potential launch today, or part of the existing trial? I spotted this at the Peet’s near our office in downtown SF. I noticed it first on Thursday and when I asked the barista, he said that they just hooked it up but were still waiting for instructions to come later. Gone are the jars of tips on the counter. :o( No more college fund. is it going to substitute paypal? Google Checkout has been running for years and it is a Paypal competitor. It’s so weird to see a Google logo, living in off the web.